Today i was asked by my daughter to share a recipe for her mentor and was told that her most favorite dish is Spanish/Italian and when she told me the name of the dish, I decided to give her bit of knowledge of the recipe as well. 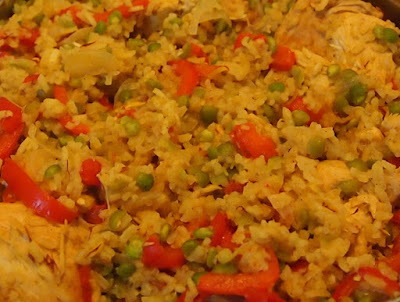 It is a mouthwatering dish which was given to us by the Moors but this time it was not the kings or rich and powerful who gave us this recipe it was the servants who gave us this beautiful and yummy recipe. It was started as a poor man and servants dish in the times when Moors ruled over Andulas (parts of Spain). The dish means leftovers and it started as the combination of Royal family's leftover dishes, after the meal of Royal family the servants used to mix all the dishes and enjoy themselves not knowing that the dish they are creating will be one of the most popular and loved dish of 21st century around the world and will be the dish for the rich but not for people who invented it (the poor). 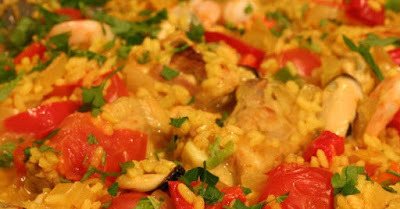 Paella was the name given to the dish which derives from Arabic word baqiyah meaning leftovers. 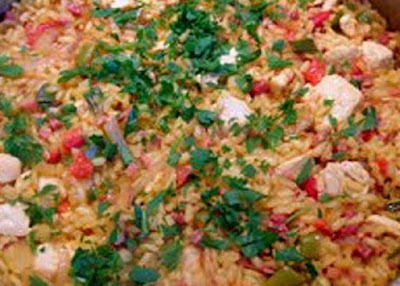 In the times when Moors ruled the farmers along Mediterranean coast took the production of rice to next level and the rice were included in every feast with vegetables, fish, meat and that is when our dish Paella was invented. 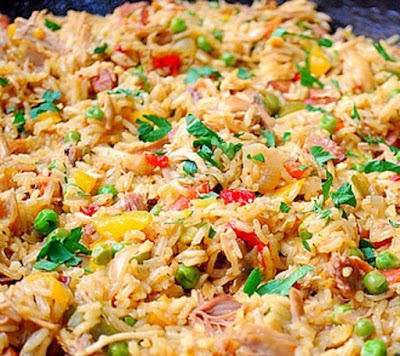 There is also debate about the word Paella being a Valencian word derives from old french paelle meaning Pan and Latin word Patella meaning pan as well, then again to take the debate more further i would like to say that paella derives from Punjabi word Pateela meaning pan. I think we should let the historians fight over the word and lets enjoy our dish. The dish was actually changed from poor to rich in 19th century when living standards of Spain rose, the ingredients were changed and the dish was given the status of Spanish national dish, even today it is considered as Spanish national dish. If you like it please do use comment box below and do not forget to subscribe our site to get updates on daily bases. Combine water, saffron, and chicken stock in a large saucepan. Bring to a simmer (do not boil). Keep warm over low heat. Heat 1 tbsp oil in a large skillet on medium-high flame, add chicken cook for 3 minutes, remove the chicken from the skillet and set aside. Add onions in the skillet and cook till transparent on medium flame, add ginger & garlic paste, tomato puree and cook for 30 second, add bell peppers and cook for another 10 minutes, stirring occasionally. Add tomatoes, red chili powder, green chilies, salt and lemon juice, paprika and cook for 5 minutes. Add rice, cook 1 for minute, stirring constantly, add chicken stock mixture, chicken and peas, Bring to a low boil, cook for 10 minutes stirring every minute or so. Sprinkle coriander and remove from the stove cover with a towel for 10 to 15 minutes.